Motherhood is a journey filled with unexpected turns and surprise hurdles. Jacquie Robison learned this lesson early on, when her daughter, Sofia, was born at just 28 weeks. 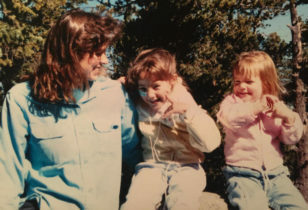 But it’s the story of their shared resilience and Jacquie’s innovative and empathetic response to her daughter’s cerebral palsy diagnosis that truly exemplifies the power of motherhood. Read on to see how Jacquie helped change the way people see kids with different abilities, and prepare to be inspired. On June 7 2009, my husband and I celebrated our one year wedding anniversary. We have a photo from the day, and in it, I’m beaming into the camera with a hand instinctively placed on my barely-there belly. I was five months pregnant. It’s one of the only pictures I have from my pregnancy. On July 6, 2009 I became a mom. My daughter was born at 28 weeks via emergency c-section, weighing 2 lbs 4 oz. I had hoped for a longer pregnancy and certainly a less frantic entry into the world for my girl. I wasn’t anything resembling ready for her arrival. I didn’t have a nursery set up and had only begun to read one of the parenting books stacked on my bedside table. There were a few baby clothes in a drawer and now I was shocked by how big the onesies looked compared to this tiny being. About the only item checked off the to-do list was her name: Sofia. For the first year and a half, our little family of three settled into a routine together and I delighted in watching Sofia grow. She flourished in identifying objects and her speech was strong. There were some gaps in hitting milestones, but I knew delays were common among premature babies, and that generally, the difference disappears at two years of age. Sofia had started to pull to stand, and I believed that we’d soon be tackling the hills of our North Beach, San Francisco neighborhood to spend afternoons playing at Joe DiMaggio Park. She was 18 months old when I first heard the words, “Your daughter has Cerebral Palsy.” I can still remember how the air in the room grew thick and my chest tightened. I struggled to take in everything the medical team was telling me. I was scared. Overwhelmingly though, I was so disappointed in myself. I felt like I had failed my daughter. Failed my family. I jumped into learning everything I could about CP—research on neurodevelopment, various therapies, and emerging interventions. As I read on, I started to frame an approach to this new normal in my mind. Cerebral Palsy is non-progressive. This was Sofia’s floor, and there wasn’t anyone who could forecast where the ceiling would be for her. I watched as she went from having difficulty weight-bearing on her legs to using a reverse walker at 3.5 years of age. Our home has a small footprint, and that meant heading to outdoor spaces so she could step around. While this wasn’t how I’d once imagined taking my daughter to the park, we began to head there as often as possible for practice. One day, as she was stepping along, she commented that people were staring at her. We had certainly navigated our share our side glances and comments, so I replied lightly, “Well, I don’t see many kiddos with walkers, so they’re probably just curious.” That satisfied her for a minute and then she offered, “But when I look at them, they look away.” As a parent, as a person, my heart broke a little bit. I had to find a way to motivate my daughter to step and encourage others to see beyond her diagnosis. I kept pulling on that thread and an idea took shape. Although I hadn’t touched a sewing machine since junior high home ec, I bought one and signed up for lessons. The first rough pattern came together and the result was a short cape for her walker with a leotard and tutu stitched on as a decoration. Sofia’s reaction was electric. She couldn’t wait to get to the park. At that outing, my heart was bursting as I watched her step along with a huge grin. And I thought that was that. But what happened next was truly magical. That first day with the walker cape, a handful of adults and a few children approached her with comments like, “Ohhh, I love your tutu” and “Do you like ballet?” She smiled and said, “I’m a ballerina. I take ballet.” I could see their joy and their surprise, as my daughter challenged their perception of what she was capable of doing. She was absolutely giddy in the car on the way home and couldn’t wait to tell dad about her fun time meeting new friends. It would make for a poignant tale to say this was my lightbulb moment and I decided to launch a nonprofit. But, it took time. First came an encounter at the park a few months later; a woman approached us as Sofia stepped around with her tutu walker cape. This visitor to San Francisco shared that her nephew in Chicago used a walker and would love something like that cape. I asked what his interests were and she said, “Oh, he loves anything to do with firetrucks and firefighters.” So, I took her address and tackled a new design, which I mailed off to her. From there, the notion that this was something that I might put out into the world started to crystalize. The 501(c)(3) organization launched in October 2017 and is called WAWOS (We’re All Working On Something). 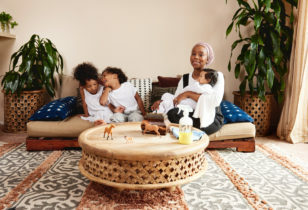 It was the rallying cry for my daughter and it reinforces that we’re all connected in striving to be our best selves—we’re more the same than we are different and we all have something about us to celebrate. The flagship program is WAWOS Wear, creatively designed walker capes that are made by volunteers and provided for free to children using a walker. In our first year of operation, we gave away 321 walker capes—almost 1 per day. Such community, kindness, and connection. My daughter is 9 years old now and doesn’t use any assistive device. She still takes ballet, and has added ukulele and skiing to the mix. She continues to see a physical therapist weekly and we do lots of at-home stretching and strengthening. There will be a lifetime of work and development for her. But she’s not the only one. As I say, we’re all working on something, together. For more inspiring stories, follow the work of WAWOS volunteers on Instagram. Also, be sure to read our piece about children’s books that teach empathy and mama Amy Webb’s advice on teaching kids how to approach and embrace differently-abled children, like her own.